NEW MINI 3 DOOR HATCH. At Barretts MINI we have a number of MINI 3 Door Hatch offers available and we can even tailor an offer specifically for you, so you can get the MINI 3 Door Hatch you want at a monthly repayment and deposit that suits you. Speak to a member of our friendly team today for your no obligation quote. Offering you the complete driving experience, the MINI hatch comes with a range innovative technologies to make navigating easier, with optional features like Apple CarPlay, real-time traffic information and online search functionality. 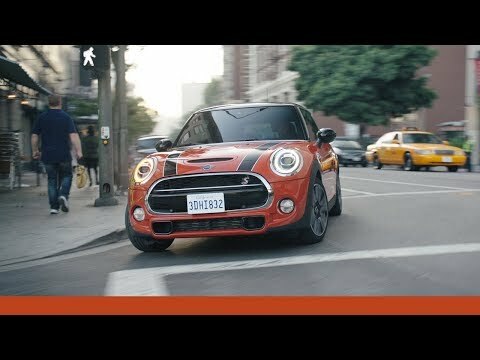 The new MINI is as practical as it is fun. With an additional 51 litres of boot space compared to the previous model, the new MINI is roomier than ever. Fuel economy is now greatly improved over the entire range thanks to the brand new TwinPower Turbo engine. And, with low CO2 emissions, the new MINI is kind on the environment as well as your wallet. THE MINI 3-DOOR HATCH IN MORE DETAIL. The MINI is the epitome of Britishness and the all-new MINI 3-door hatch is going back to it's roots. The iconic MINI wings have had a make over and the updated, MINI-malistic style is sharper than before. Enjoy the MINI experience from the moment you unlock the doors with an optional MINI Logo projection on the ground to greet you. Another nod to our rich heritage are the new Union Flag LED rear lights. These lights are a graceful touch which are both eye-catching and energy efficient whilst producing a clearer and brighter shine. ​​Front and rear LED lights. ​17" John Cooper Works Track Spoke alloy wheels in black. 17" Roulette Spoke alloy wheels. MINI Yours fibre alloy interior style. Terms and Conditions: Official Fuel Economy Figures for the MINI Range: Urban 27.2-72.4 mpg (10.4-3.9 l/100km). Extra Urban 47.9-91.1 mpg (5.9-3.1 l/100km). Combined 37.7-83.1 mpg (7.5-3.4 l/100km). CO2 Emissions 89-175 g/km. Figures may vary depending on driving style and conditions. Barretts MINI trading as Barretts of Canterbury Ltd is a credit broker not a lender. Our deposit contribution only available with MINI Select.Finance example is for a MINI Select agreement for the model shown above. Applies for vehicles ordered at Barretts MINI between 1st April 2019 and 30th June 2019 and registered by 30th June 2019 (subject to availability). Retail customers only. * On the road cash price is based on manufacturer’s recommended retail price and includes 3 year MINI Retailer Warranty, MINI Emergency Service, 12 months’ road fund licence, vehicle first registration fee, delivery, number plates, VAT. **Optional final payment and option to purchase fee not payable if you opt to return the vehicle at the end of the agreement (vehicle condition, excess mileage and other charges may be payable). Finance available subject to credit acceptance to UK residents aged 18 or over. Guarantees and indemnities may be required. Terms and conditions apply. Offer may be varied, withdrawn or extended at any time. ‘MINI Select’ is a form of hire-purchase agreement provided by MINI Financial Services, Summit ONE, Summit Avenue, Farnborough, Hampshire, GU14 0FB. You will have a 14 day statutory right to withdraw from the agreement. Barretts of Canterbury Ltd, trading as Barretts MINI , commonly introduce customers to a selected panel of lenders including MINI Financial Services. We may receive commission or other benefits for introducing you to such lenders. This introduction does not amount to independent financial advice. Images shown are for illustrative purposes only, additional paintwork, upholstery and Pack charges may apply.